Android's widgets are really, really useful for certain things. They also are generally pretty ugly and take up a lot of homescreen space. Everyone has a different philosophy when it comes to organization of their homescreens, but most can agree that 'simple looks better, but often less useful.' Using some great apps, you can have the best of both worlds; all of your widgets at your fingertips without the clutter of having 5 different media widgets taking over your home screen. The basic setup that I have found uses Overlays ($1.99 for pro) and Tasker ($2.99). Overlays allows you to create a little popup screen with the widgets you want. I found Tasker to be better at calling up the Overlay screen and dismissing it than Overlays' built in shortcut/widget setup. This is simply a starting point as you can incorporate other tools like Trigger, NFC tags, bluetooth speakers to further automate your life. First, make sure that you have "Global" Overlays turned off to start or you'll have your widgets floating over everything all the time, not just when you need them. Also, you can edit the settings so it doesn't run on boot and notifications are hidden. Tasker will boot up and dismiss the Overlays as needed. I even went as far as to disable Overlays' notifications in my Android System Applications Settings. This is personal preference since I like a nice clean notifications bar. Second, create a profile in the "Global" tab in Overlays called "Media Widgets." 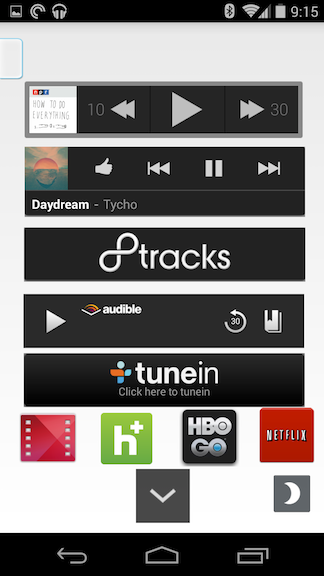 Add your media widgets to the screen and resize them so they look as good as possible. Add a "Task Shortcut" to your launcher (depending upon your launcher it will be available in widgets or shortcuts). You'll be prompted to pick a task. Choose "New Task" > name:"Call Overlay"
In the task, add an action > Plugin > Overlays > Configuration > "Media Widgets" > "On". Also in the task, indicate an icon (bottom right of task shortcut definition screen) > "Built in icon" and then pick something that makes sense like a picture of some headphones or something. You can do this by setting a timer via Tasker or adding a button that dismisses the widget folder. To use a button, you'll need to add a shortcut to the overlay that calls a Tasker task that turns the Overlay off. To use a timer, you'll need to incorporate a "pause for X seconds" and "dismiss overlay" action in your task that calls the media overlay. This framework can be used in conjunction with some other tools to do some very, very cool things. What I've done is integrated the Overlay and Tasks with NFC chips that are next to bluetooth receivers throughout my house. I have them in a couple rooms, so it's handy to have the NFC chips that, for example will: tap NFC chip, connect to bedroom bluetooth automatically, pop up my media widgets so I can quickly play the music/podcast/audiobook that I was listening to earlier. I wrote this post partially to see what other crazy schemes people have used these tools for, so please share your experiences below!